A large flag is brought onto the court by the CSUSB ROTC. Current and former members of the military do so much for our country, so CSUSB Athletics and the Veterans Success Center (VSC) teamed up to show our appreciation. U.S. military service members, including active-duty service, reserves, National Guard members, veterans, ROTC and their families filled the Coussoulis Arena on Jan. 21. Admission was free for military personnel. The festivities began with a tailgate that included food, entertainment, giveaways and raffles. It continued inside the arena with more entertainment and different appreciation ceremonies. There was a wide array of raffle items, including a Mike Scioscia autographed baseball, who is the current Los Angeles Angels Manager, restaurant gift certificates and Los Angeles Chargers tickets. Before the men’s and women’s teams took on CSU San Marcos (CSUSM), the color guard performed and the national anthem was sung by CSUSB’s Jazz ensemble. 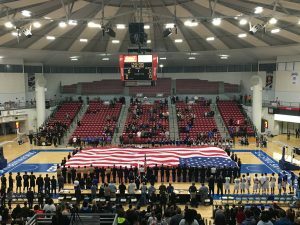 For the men’s game, local high school ROTC units rolled out a giant flag covering the entire court while the anthem was sung. “It was really cool to see everyone come together and show so much support towards the military,” stated attendee Susan Ibarra. “It really showed when the national anthem was being sung and the flag was being rolled out,” added Ibarra. While the games were in progress, military personnel were interacting with fans, giving away shirts and different prizes. Fans were able to talk with them and give thanks for all of their service. At halftime of the women’s game, enlistees were sworn in the Army and gave their oaths to defend the United States Constitution. At the men’s halftime, the Junior ROTC drill team performed. “The energy in the arena was crazy,” stated Lindsay Kilgore, a freshman on the women’s team. “It was a cool atmosphere to be a part of,” added Kilgore. “It reassures the people who have served or are serving that people still care and thank you for their service.” added Hollinshead. The VSC is dedicated to supporting those with a military background. They want service women and men journey to be successful and are more than willing to give them the resources and information needed to do so. CSUSB Athletics aims to team up with the VSC each year to host an annual Military Appreciation Night. The Military Appreciation night was a success, and our service women and men deserve to know they have the support of CSUSB behind them. It really meant a lot that the school had a special night to honor us. It’s good to know our service is still valued,” stated US Army member Caleb Gill. The men’s team ended the night with a thrilling 106-100 win. The women’s team’s 4th quarter comeback fell just short and CSUSM took the four-point win. Overall, the night was a success. The arena was packed with fans for both the basketball teams, as well as in support of the military.